The mayor of New Orleans has issued a mandatory evacuation order for the entire city, as Hurricane Gustav bears down on the US Gulf Coast. Ray Nagin said residents of the city's West Bank should begin moving out at 0800 (1300 GMT) on Sunday, with the East Bank leaving at midday (1700 GMT). He called it "the storm of the century" and added: "You need to be scared". Gustav, which is forecast to strengthen to a Category 5 storm over the Gulf, powered through western Cuba overnight. Gustav ploughed through Cuba's Isla de la Juventud, or Isle of Youth, overnight on Saturday before hitting the mainland in Pinar del Rio province, home to Cuba's lucrative tobacco plantations. The storm, which has now moved into the Gulf of Mexico, currently has maximum sustained winds of nearly 240km/h (150mph), with even stronger gusts. At least 300,000 people have been evacuated in Cuba, says the BBC's correspondent there, Michael Voss. There has been extensive flooding and reports of severe damage where the storm has hit, but no reports of fatalities. Officials on Isla de la Juventud said that nearly all the island's roads were washed out and many areas were underwater. Hours before Mr Nagin spoke, a hurricane watch was put in place along America's North Gulf coast, from Texas along to the Alabama-Florida border. THREE: Winds 111-130mph. Storm surge 9-12ft. Katrina hit New Orleans as a three. The BBC's Kevin Connolly, in New Orleans, says Mr Nagin spoke in "passionate and desperate" terms, telling a televised news conference the storm was "so powerful" and growing more powerful every day. "I'm not sure we've seen anything like it," he told reporters at City Hall. 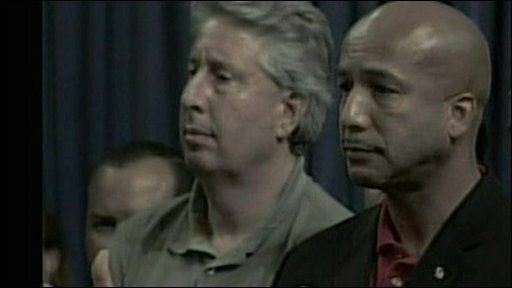 Mr Nagin said Gustav - expected to make landfall on Monday or Tuesday - was more powerful than Hurricane Katrina. That storm, which hit New Orleans in 2005, killed some 1,800 people and caused hundreds of billions of dollars worth of damage. Addressing anyone considering riding out Gustav, Mr Nagin said: "I have news for you - that would be one of the biggest mistakes of your life". The mayor said he was aiming for a 100% evacuation, which extends to members of the emergency services - fewer than 50 city workers will remain in the city. Mr Nagin described the threat facing New Orleans in stark terms, calling Gustav "the mother of all storms" and urging people to follow the evacuation order. Mr Nagin said that there would be no emergency services to help anyone who chose to remain in the city. "If you are stubborn enough, if you are not taking this as seriously as we need you to take it, and if you decide to stay; you are on your own." The mayor, who was in office when New Orleans was hit by Hurricane Katrina in 2005, said those who stayed would almost certainly be stranded in a flooded city. "Anyone who decides to stay, I'll say it like I said it before Katrina: make sure you have an axe, because you will be carving your way, or busting your way out of your attic to get on your roof with waters that you will be surrounded with in this event," he said. "So anyone who's thinking of staying, rethink it, get out of town." Our correspondent says that thousands of people were already beginning to leave the city before the evacuation order was announced, joining a continuous stream of vehicles heading north. State governor of Louisiana Bobby Jindal was in New Orleans to observe the evacuation taking place. "We're pleased to see so many people taking the evacuation order seriously, you're literally seeing tens of thousands of people being evacuated from this Union passenger station right here. "You're seeing people go by bus, by train, they are being taken by bus to the airport to be flown out of harms way as well. We can fly 700 people per hour out." Meanwhile, Republican party presidential candidate John McCain and his running mate Sarah Palin announced they would travel to Mississippi on Sunday to observe storm preparations there. Republican officials are considering what to do about the party's National Convention (due to open on Monday) depending on when and where the storm hits. Mr McCain hinted there might be changes to the tone of the gathering, rather than a cancellation of the event. He told Fox News: "You know it just wouldn't be appropriate to have a festive occasion while a near tragedy or a terrible challenge is presented in the form of a natural disaster, so we're monitoring it from day to day and I'm saying a few prayers, too." The hurricane has already claimed the lives of more than 80 people in the Caribbean. It has swept through Haiti, the Dominican Republic and Jamaica over the past week, causing widespread damage. It has strengthened rapidly from a tropical storm to a Category 4 hurricane, and is expected to grow to a Category 5 storm - the maximum on the scale - as it crosses the Gulf of Mexico.